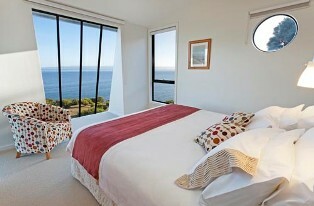 Exclusive waterfront hideaway perched above the scenic rocks of Great Oyster Bay, Freycinet. Ideal holiday retreat away from the maddening crowd. Two separate sleeping houses for your privacy whilst travelling with friends. "The Waterfront" and "The Boat House" . For the bird lovers - Abundant bird life all year round. 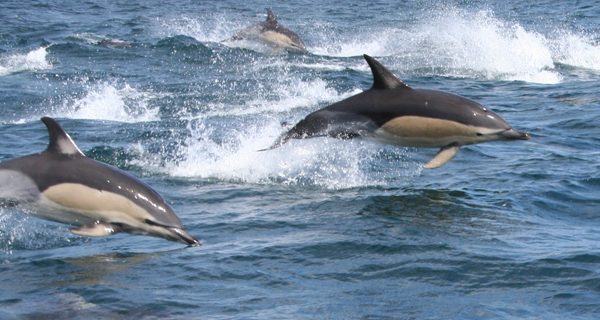 Seasonal dolphin and whale sightings. BBQ facilities, 80cm TV/DVD Player, wood fire, electric heating and electric blankets. Luxury King/twin and Queen bed. Comfortable furnishings, fully equipped kitchen with gas cook top for the gourmet chef. A few minutes walk to the beach. 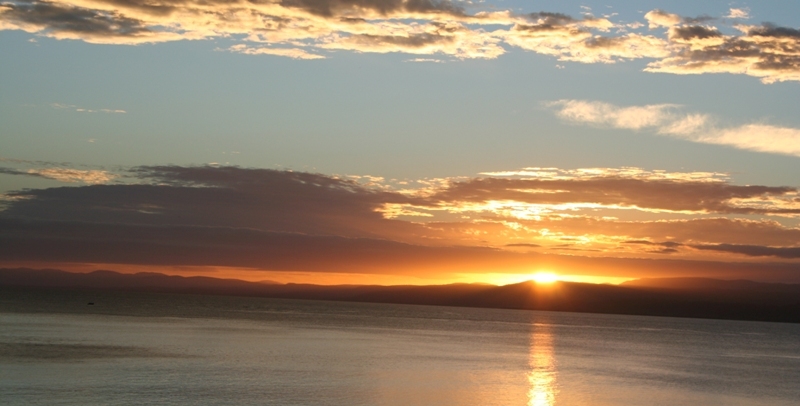 Short drive to the golf course, Friendly Beaches, Freycinet National Park and Coles Bay village. Due to the floor plan of separate sleeping areas and the proximity of the unfenced cliff, Hazards Hideaway is not suitable for young children. 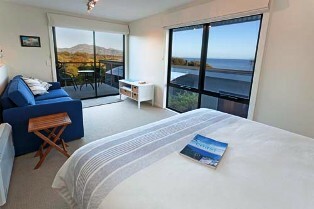 The Waterfront is an exclusive hideaway perched above the scenic rocks of Great Oyster Bay, Freycinet. The self contained apartment features luxury twin beds and pull-out sofa bed suitable for third person. Comfortable furnishings, fully equipped kitchen with gas cook top for the gourmet chef. There is also full BBQ facilities, an 80cm TV/DVD Player, wood fire, electric heating and electric blankets. Perfect for a secluded getaway. 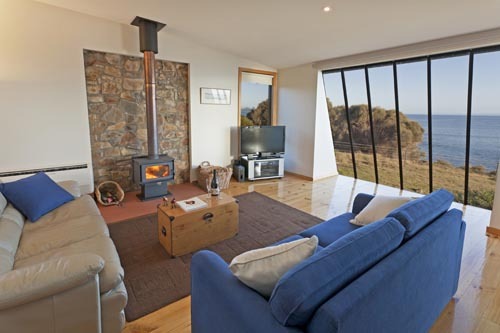 Hazards Hideaway is an exclusive hideaway perched above the scenic rocks of Great Oyster Bay, Freycinet. The hideaway offers two separate sleeping houses (each with it's own bathroom facilities) for your privacy when travelling with friends. ‘The Waterfront’ King/Twin bed & ‘The Boat House’ Queen bed. To ensure your privacy 'The Boat House' is only let to guests travelling with those staying at 'The Waterfront'. This self contained beach house features comfortable furnishings, fully equipped kitchen with gas cook top for the gourmet chef. There is also full BBQ facilities, an 80cm TV/DVD Player, wood fire, electric heating and electric blankets. The self contained apartment features luxury king/twin bed. Comfortable furnishings, fully equipped kitchen with gas cook top for the gourmet chef. There is also full BBQ facilities, an 80cm TV/DVD Player, wood fire, electric heating and electric blankets. The self contained apartment features luxury king bed and pull-out sofa for third person. Comfortable furnishings, fully equipped kitchen with gas cook top for the gourmet chef. There is also full BBQ facilities, an 80cm TV/DVD Player, wood fire, electric heating and electric blankets.